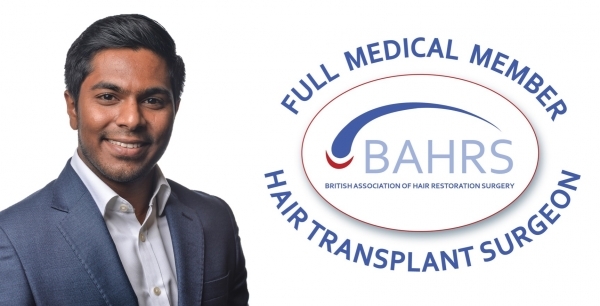 Dr Fernando, lead hair transplant surgeon at The Treatment Rooms London, is now a full member of the British Association of Hair Restoration Surgery. What is the British Association of Hair Restoration Surgery? BAHRS has a strict code of conduct and standard when it comes to hair transplant surgery. Any member of BAHRS is required to uphold these principles. As a result, if you visit a surgeon who is a BAHRS member, you can expect them to provide you high quality hair transplant surgery as outlined by BAHRS’ professional standards. As of January 2019- Dr Fernando is now a full member of the British Association of Hair Restoration Surgery. He continues to work tirelessly to give his patients the highest quality hair transplant surgery. This includes working to BAHRS’ professional standards. It means no corners are cut in delivering hair transplants to patients in London and the wider UK. For more information, you can click the link (here).